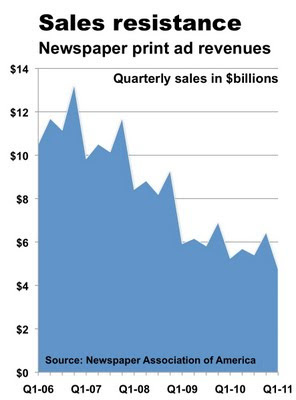 Following an unexpectedly sharp decline in advertising demand in the first three months of this year, newspapers now appear to be entering the sixth year of an unprecedented collapse that has vaporized half of their principal revenues since 2006. The Newspaper Association of America, the industry’s trade association, reported yesterday that print sales fell by a steep 9.5% in the first three months of the year, dropping industry-wide print sales to $4.7 billion, a level not seen since 1983. 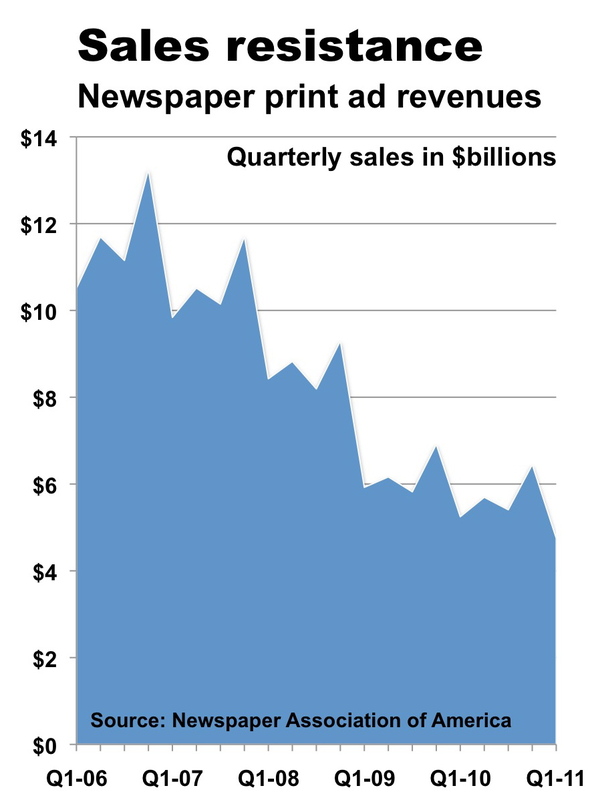 Print sales in the first quarter of 2011 were only 45% of the $10.5 billion in revenues produced by the industry in the first quarter of 2006, the last three-month period in which newspapers collectively showed positive year-to-year growth. As illustrated in the chart below, print sales have been falling relentlessly since April 1, 2006. In the first quarter of 2011, real estate classified advertising slid by 19.3% from the prior year, while national tumbled 11%, retail fell 9.5% and auto classified was down 4.7%. Only employment classified gained by 4.3%. With publishers reporting anecdotally that these negative trends are continuing in the current quarter, it is all but certain that the revenue crisis has entered its sixth year. Although the growth of digital advertising since 2006 has offset some of the decline in print sales, total ad sales for newspaper industry in the first period of this year declined by 7.0%, according to the NAA. At a bit less than $5.6 billion, industry ad sales in all categories in the first period of 2011 were exactly half of the $11.1 billion in consolidated ad sales achieved by newspapers in the first quarter of 2006. Seeking to find whatever cheer he could in the industry’s first-quarter sales performance, John Sturm, the soon-to-retire chief executive of the NAA, noted that online revenues now represent a historically high average of 15% of newspaper ad sales. But Sturm’s statement underscores the fact that print remains the predominant revenue stream for newspapers. And the problem with print sales is that they began falling before the recession began, plunged vertiginously during the downturn and have failed to rebound ever since. As reported previously here, television, Internet, radio and magazine advertising recovered in 2010 from the pummeling that all media companies took during the slowdown. At the same time ad sales at competing media moved into positive territory, however, newspaper sales fell by 6.3% in 2010. Even though newspaper sales were slower to bounce back than other media, most publishers believed – or at least fervently hoped – that a steadily improving economy eventually would stabilize their sales. “Flat is the new up,” quipped more than one publisher last fall in summarizing their revenue hopes for 2011. But it was not to be. After print sales slipped by about 7% per quarter in the last nine months of 2010, newspaper executives were stunned to see sales fall with a renewed vengeance in the new year. The reason newspaper sales are not recovering is that consumers and marketers are moving ever more aggressively to the digital media. Consumers can find more information, can obtain more choice and can transact business more efficiently on a laptop or a smart phone than they can with even the very best newspaper. Advertisers understand this. Further, advertisers know they can target customers more efficiently via the digital media than they ever can with print – and at a much lower cost per transaction, too. The bad news for publishers in the first-quarter figures is that the stubborn refusal of ad sales to recover removes any remaining doubt that newspapers are experiencing a secular change that will radically change their businesses forever. A secular change like, say, the move from kerosene lamps to electric lights is one that does not reverse itself when the economy improves. The worse news for newspapers is that tumbling ad sales are reducing the resources and, thus, the time that publishers have to reinvent their franchises to meet the expectations of modern consumers and advertisers. Newspapers have phenomenal assets that any other business would envy: high-profile brands, large sales forces, unparalleled content-creation capabilities and the power of their existing media to promote new digital products and services. But they have to use them or lose them. And they will have to be faster and bolder in the future than they have been for the last five demoralizing and terrifying years. This is a great social media story in that it elicits a response from the reader, however it is a little one sided in reference to the actual data. The same Newspaper Association of America report that you reference in your article shows newspaper website revenue doubling for the third consecutive quarter. So, newspapers do have a growing source of new revenue. Is it growing fast enough? Maybe not. Second, the explosion of social media and online couponing present another growing opportunity of for traditional newspapers to grow revenue. Third, traditional newspaper operations are shrinking strategically in line with print revenue, so that bottom line profits remain strong. And, making a profit why news media are in business. Now to your recurring point, do consumers prefer their news digitally instead of in print. I believe there is a growing number of consumers who do. However, as your article demonstrates, consumers want reliable, well-balanced news reporting and that the one thing news media companies have in their favor. The change in consumer preference will driving news media companies to evolve but not go extinct. TV shows were in no way "better entertainment" but they were available 24/7 and home delivered. Both TV and Movie theaters are being seriously challenged by the internet and DVDs. Print media (both newspapers and book publishing) are now under pressure from a changing market.